Safety Aside, What Happened to Respect? Recently – as happens at least weekly – I came across yet another of those “adorable” photos of a child mistreating a dog, with a caption to the effect of “what a great dog” he was to have such patience with the baby. The poor dog in this particular photo was clearly tolerating the smooch of a toddler who appeared to be grabbing part of the dog’s eye with his little baby fingers. While we professional trainers were up on our high horses, discussing how ridiculous people are in allowing such risky behavior to continue, it occurred to me that even if the dog were completely safe with the children – as some extremely tolerant dogs seem to be – why aren’t the people concerned about the treatment of the dogs themselves? I ask why the definition of a good dog is often, ‘You can do anything to him.’ That wouldn’t make any sense if phrased in terms of other relationships: ‘I have a really good wife. You can do anything to her.’ Creepy! A boy and his dog – mutual respect. I find it troubling that some people are so determined to prove how great their dogs are, that they seem to forget that these dogs have feelings too! And I don’t mean just emotions, but physical feelings of pain and discomfort. Granted, sometimes we don’t have a choice but to suffer discomfort or pain, as with doctor visits or vaccines, but when we can prevent discomfort, why don’t we? I tell my clients not to allow their children to do anything to a dog that they wouldn’t allow done to themselves. Would you let a child pull your earlobe until it hurt? Or bite your forehead with his little baby teeth? I can tell you that my tolerance for that would be low. Of course, I wouldn’t injure the child, but I would make it stop and redirect the child to something less painful, such as chewing on a teething ring. Similarly, if you see a child doing something like this to your dog, redirect the child. If your dog learns that you will step in to protect him, then he will not need to ever defend himself, and he will be able to remain the great dog that you know him to be. I was out with my 2-1/2 year old the other day, walking across a big open space when two other small children ran by her. She immediately forgot about me and started to chase the other girls. As I watched her in surprise, I was reminded of a similar incident that I observed with a friend several years ago, as she was running her dog along an agility course. The dog was running perfectly, following every cue, until a low-flying crow crossed her path. As if caught on a hook, she instantly forgot her handler and followed the crow as it flew to the other side of the field. She only stopped because there was a fence at the end. I know how much people hate it when we compare children to dogs, yet we are constantly reminded of how similar their reactions can be. When working with my clients and their dogs, one of the mantras that I continually repeat is that they have to do what they can to remain “more interesting than dirt” to their dogs. We all know how interesting dirt can be, with all its smells and hidden information to them. As it turns out, with children, we may not be competing with dirt, but definitely with the environment. Going for walks through the neighborhood, the dogs stop to smell every bush and leaf that we pass, checking their “pee-mail” as many people lightheartedly say. The youngster stops at each flower, or to pick up pretty rocks or cool sticks along the way. To keep her interest and keep her moving along, I tell her stories and point out other interesting things further along the path. And there is plenty of praise to reinforce her for moving along and following my instruction. Similarly, when my dogs are moving along on a loose leash, I reinforce them with plenty of praise and positive feedback. Of course, it’s may be more intuitive to play with human children than with dogs, since we are humans after all, adapted to rearing children. But the concepts are similar. I tell people to play with their dogs in order to strengthen the bond, and thus have dogs that want to work for them and are more focused. As parents, we are encouraged to play with our children as well, to improve our relationships and help them feel special. I have noticed that, outside of our close family, the people whom our daughter most enjoys are those who play little games with her or do interactive things with her. So get out there and play with your dogs and your kids! 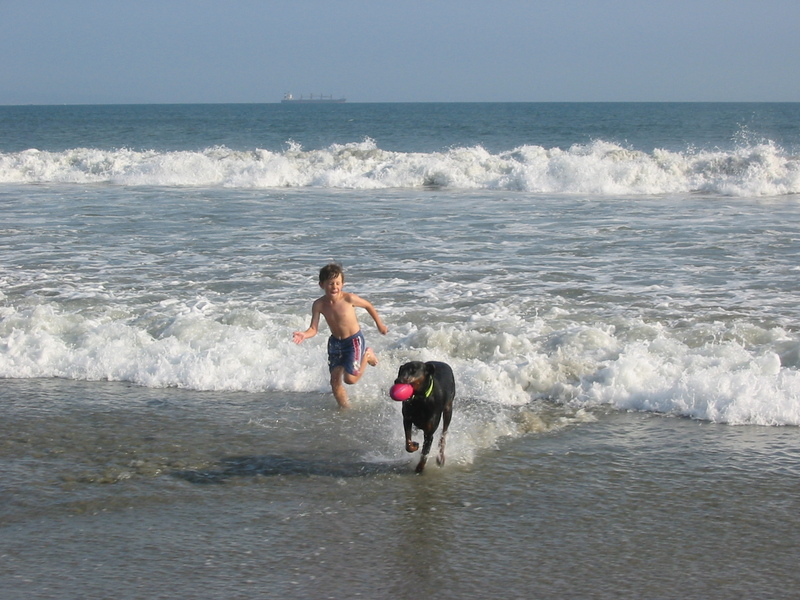 There are games and activities that you can all play together, such as fetch. Whatever you do, have fun and you’ll find that your kids and your dogs will prefer your company over others.